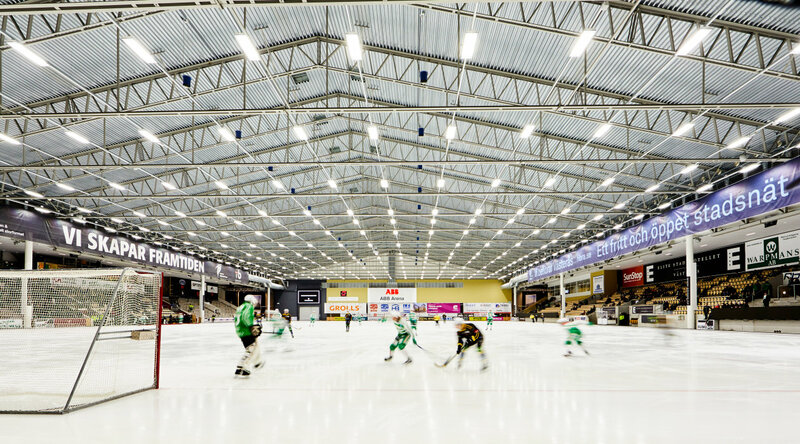 New glare-free lighting in LED for the largest cohesive sports facility in Sweden. ABB Arena Syd is Västerås bandy arena. The arena is located on the city’s major sports and event site Rocklunda. The arena is one of Sweden’s most modern indoor bandy arena with unique possibilities. The stadium has a capacity of 9000 spectators, and among other events a competition for selecting the Swedish contribution to the Eurovision Song Contest has been held at the arena. There are outdoor and indoor arenas for sports, leisure, fairs, exhibitions, concerts, conferences and more. The outdoor area covers 100 000 square meters. Planning the lighting for such an environment involves many challenges. Creating the lighting with OSRAM LS160 LED and the control system Encelium, has improved the light level, reduced energy consumption and reduced the number of luminaires compared to the conventional T5 fluorescent luminaires that was installed in ABB Arena Syd ten years ago. The fluorescent luminaires that creates lighting for the game area in ABB Arena Syd have been replaced with new luminaires with LED technology, which is both energy efficient and reliable. The pace of the technology development in the lighting industry has increased massively since the old fluorescent luminaires that was installed ten years ago. The new luminaires are much more effective than the conventional T5 fluorescent luminaires, which means that with fewer luminaires, it is possible to reach a higher vertical and horizontal illuminance that allows TV broadcasting in the arena. The number of luminaires have been reduced from 480 luminaires to 273(! ), and still it is possible to achieve 25 % higher light output. In conjunction with the change of the lighting system, OSRAM control system Encelium was also installed to optimize energy consumptions. “With the new control system we have now an overview of our facilities, how much energy we are saving every month and how long the luminaires have been lit. This facilitates our maintenance at the arena,” says Björn Sandvall, Technical Manager at Rocklunda Fastigheter AB, which runs the facilities at Rocklunda. A motion sensor was placed over the ice that detects when the ice is not being used and dims down the lighting and finally turns it off after a while to reduce energy consumption. The energy consumption for lighting have been reduced by over 70 %(! ), in kilowatt hours the saving exceeds 600,000 kWh, which is equivalent to one year’s electricity consumption in 22 electric heated villas. The energy saving LED luminaires LS160 from OSRAM/Siteco is a ball impact resistant high bay luminaries that provides 25 000 lumens and is rated IP65 with a lifetime of 70 000 hours (L70/B50). "The energy saving was an important factor in the decision for carry out the change of the luminaires, achieving a 70 % energy saving while increasing the illuminance to meet the requirements for TV broadcasting is of course positive," says Björn. 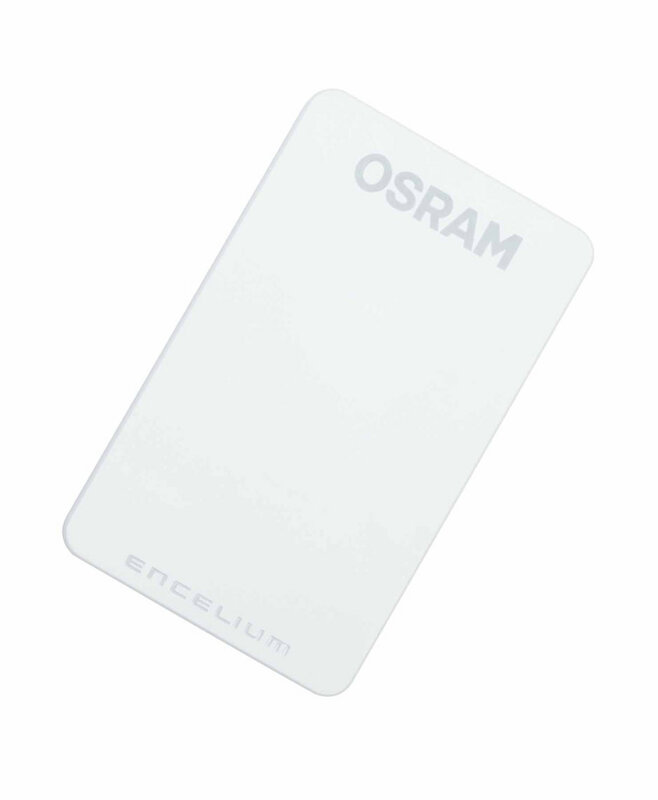 The main reason for us to choose the new LED luminaire from OSRAM was that it is completely glare-free for players that participates in the game.